provide individual identification or pricing. Nor will I make judgments on color or damage. This information is provided for the convenience of Carnival Glass collectors. I took the photos (unless noted otherwise) and they are copyrighted by me. Please do not use them for publication, either in print on the Web. The prices were compiled from a database of more than 200,000 auction sales over the last 25 years or so. Click on the header above to go to a list of articles about different aspects of Carnival Glass--some from Carnival Glass newsletters, some written especially for this site. Forty-two photographs of patterns that appear on the reverse of bowls, plates, and compotes. More than 50 of the most common patterns of candlestick holders, along with a few rare ones. This should help you identify your candlesticks more easily. This is a question that confuses many people new to collecting Carnival. 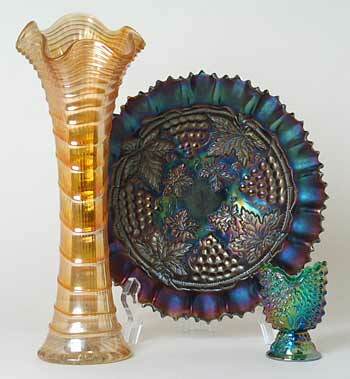 Primarily, Carnival Glass is pressed glass that has had an iridescent coating applied. Remember, if it isn't iridized, it isn't Carnival. Pressed glass? This is glass that has been formed by being pressed into a mold while in a hot molten form. As it cools, it takes on the shape and detail of the mold. Once removed from the mold, and while still relatively hot, it is sprayed with metallic salts in liquid form which gives it the "oil-on-water" multicolor appearance. Carnival Glass was first produced by Fenton in 1907 and was made continuously until 2011. There were 5 or 6 major makers of it originally, but Fenton lasted longer than any of the others. There are about 2,000 different patterns in Carnival Glass, many of which are similar, leading to much confusion. This site details most of the known patterns but there are also many obscure patterns that I don't cover. Colors can also be confusing. The most common is marigold, the orange color seen in the Ripple vase above. This color is always found on clear glass, but other colors are defined by the color of the glass, not the iridescent coating. The dark colored bowl above (Northwood's Grape and Cable) is purple or amethyst, the toothpick holder is green. The toothpick holder, by the way, is a contemporary piece--very few toothpick holders were made in Carnival during the original period of 1907 to 1930. Because there are so many aspects to Carnival Glass, collecting it can by both an exhilarating and frustrating experience. Explore the sections on patterns and colors on this site, but just as importantly, go to conventions and auctions to see the glass first hand.